This report presents women’s testimonies in respect of various issues during the reporting period of January 2012 to March 2016. These issues include the dangers posed to women by the presence of armed actors in communities; the effects of land confiscation and development projects on women’s livelihoods; women’s access to healthcare and education; the continued occurrence of gender-based violence; and the harms caused by landmines; forced labour; arbitrary taxation and extortion. Importantly, women’s actions and agency in the face of abuse and injustice are also documented in this report. These agency strategies are documented to highlight women’s actions as women are not passive recipients of abuse. The time period covered in Hidden Strengths, Hidden Struggles, January 2012 to March 2016, was characterised by dramatic and substantial changes in Myanmar, including the political reform process; the 2012 preliminary ceasefire agreement between the Karen National Union (KNU) and the Government of Myanmar; the 2015 Nationwide Ceasefire Agreement (NCA); and the November 2015 general election, in which the National League for Democracy (NLD) won a landslide victory, marking a change of course from the previous reign of consecutive military-backed governments. This report comes ten years after KHRG published Dignity in the Shadow of Oppression, an extensive report highlighting the abuse and agency of Karen women in southeast Myanmar, in a highly militarised context during the conflict period. Hidden Strengths, Hidden Struggles revisits perspectives and abuses explored in that report, as well as new ones identified by KHRG community members, and sheds light on the situation for women in the present context. KHRG launches this report at a time when women’s issues, both in Myanmar and globally, are gaining momentum, and women are increasingly asserting their right to be considered as equal stakeholders in Myanmar’s future. The detailed portrayal of women’s voices in this report is based on an analysis of 1,048 documents, including 98 interviews with women, collected by KHRG between January 2012 and March 2016. This report aims to present a comprehensive picture of the changing roles and experiences of women in southeast Myanmar. KHRG presents the perspectives of local women on issues identified by them, including livelihoods, militarisation,health, education, and others. The report outlines human rights abuses that are of particular concern for women, including gender-based violence (GBV), and how continued human rights abuses in southeast Myanmar affect women and men differently, an aspect that is often overlooked. In addition, it highlights the agency strategies that women employ for self-protection, and the challenges they face when attempting to access justice for abuses. Finally, the report suggests ways to address the issues raised and improve the situation for women in southeast Myanmar, by giving concrete recommendations to the Government of Myanmar, ethnic armed organisations, local and international civil society organisations, and the international community supporting the peace process and in Myanmar. 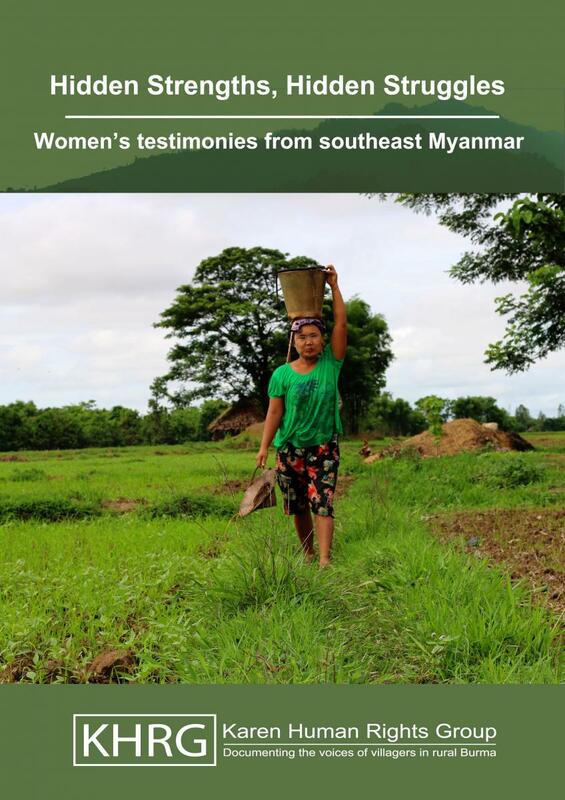 KHRG is confident that this report will provide a valuable resource for practitioners and stakeholders working on issues related to southeast Myanmar, and that it can be used as a tool in developing an awareness of local women’s concerns and agency. KHRG also believes that the report will be equally interesting for members of the general public who would like to learn more about women’s perspectives of the situation on the ground in rural southeast Myanmar. 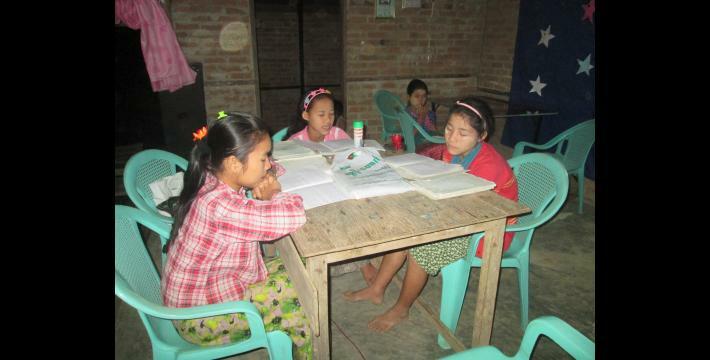 Between the January 2012 preliminary ceasefire, signed by the Karen National Union (KNU) and the Government of Myanmar, and March 2016, women in Karen areas of southeast Myanmar generally reported that they were suspicious and distrustful of government-led health and education initiatives. Women expressed doubts over government staff training and skill, and incidences were reported of untrained healthcare workers prescribing incorrect dosages of medicines. The long distances between villages and post-primary schools disproportionately affected women and girls from rural areas. Rural girls were in some instances discouraged from seeking further education in towns due to concerns for their safety and traditional attitudes preferring that they stay near to their families. The long distances between villages and adequate healthcare facilities disproportionately affected women and girls from rural areas. Rural women reported their concerns about not being able to access hospitals during pregnancy or when giving birth, with many women continuing to give birth at home without access to adequate healthcare. Other barriers to accessing health services included perceived security threats, such as safety when travelling, and the financially prohibitive cost of medicine and treatment. Women expressed that they wanted to ask questions and understand more about local schools and health services but that they faced barriers when they sought to access information or made suggestions. In addition, a number of women felt that the quality of healthcare and education delivered across southeast Myanmar depended in large part on individual staff attitudes. Upfront and hidden costs in the health and education sectors served as a barrier for women to access essential services. Hidden costs included requests for additional fees for unclear purposes in schools. A number of women reported that they had observed a retreat of women from positions of authority, such as village or village tract leader, in some areas of southeast Myanmar, following the reduction of conflict in the aftermath of the 2012 preliminary ceasefire, and the return of men to villages. Despite the 2012 preliminary ceasefire, and the subsequent Nationwide Ceasefire Agreement, women continued to describe security concerns related to the presence of armed actors, primarily the increased risk of gender-based violence (GBV). Continued perceived threats served as a deterrent to accessing farmlands and forests for livelihood activities, and accessing education and healthcare providers. Several women expressed that they did not see the 2015 election as relevant to the Karen people in southeast Myanmar. While some women showed a cautious optimism regarding the results of the election, others were hesitant to make judgments regarding its potential impacts. Women with mental health conditions or women who were less educated were especially vulnerable to gender-based violence, and were disproportionately represented in KHRG’s reports. Women with mental health conditions were often perceived as less able to physically resist abuse, and negative attitudes towards mental health conditions made it more difficult for them to report abuse. Perpetrators of sexual assault were reported to often come back to explicitly threaten and violently abuse the women they had assaulted, and their female family members, in order to deter them from reporting and speaking of the incident. Such perpetrators of GBV routinely enjoyed impunity for their actions and were able to retaliate against women who attempted to report abuse. This problem was compounded in cases where the perpetrators were powerful actors, such as military personnel. Women who suffered GBV faced extensive barriers to accessing justice. Women who reported abuse were often disbelieved or judged to be responsible for their own abuse. Typically, small sums of compensation as a form of resolution in GBV cases were not deemed a sufficient or appropriate resolution by those who suffered instances of GBV. 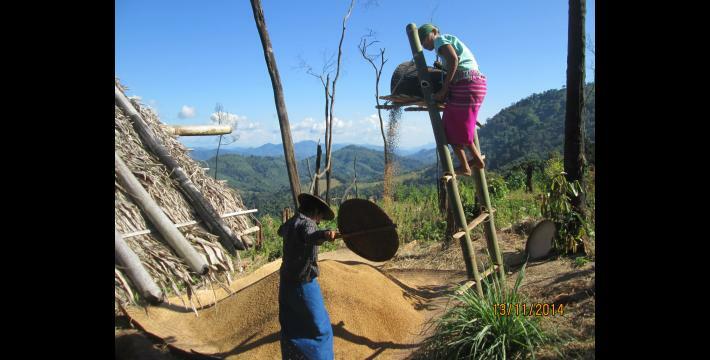 Land confiscation was the most common abuse facing women, across southeast Myanmar. Land confiscation perpetrators included the Tatmadaw, BGFs operating across southeast Myanmar, national and international businesses, and the Government of Myanmar. Development-related projects were identified as causing increased land confiscation, most commonly in the form of road construction, infrastructure development, commercial agriculture, and mining. Women expressed a desire to be involved in consultations related to development projects in order to ensure positive benefits for their communities. Women reported employing various forms of agency to combat land abuses; these included writing complaint letters, engaging in direct negotiation, reporting to village heads, and seeking to register their land. Women sought resolution to these cases through compensation, mediation, and investigation by authorities. In the majority of cases, women faced significant obstacles to their being able to access justice, related to land confiscation cases. These included difficulties in meeting with authorities, and villagers’ lack of access to clear information on the details of confiscations. When compensation was promised or given, women were typically unsatisfied with the amounts offered. Notably, single women, women who were widowed, and women whose husbands were not living with them, reported feeling a heightened vulnerability with regard to their livelihood security, due to pressures from land confiscation, as well as the impact of development and infrastructure projects. The environmental impact of development projects affected women’s livelihoods through river pollution, erosion of their farmlands, and the destruction of, or loss of access to, communal forest lands. Women identified additional environmental challenges, such as unpredictable weather and pests, as also negatively impacting their food security and livelihoods. 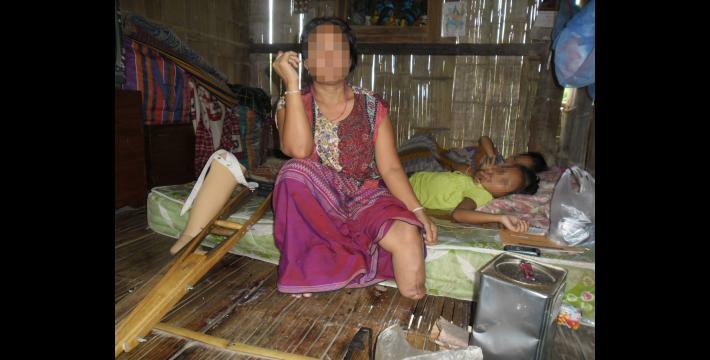 Despite the 2012 preliminary ceasefire, women in southeast Myanmar reported that they continued to face the severe consequences of landmine contamination. These included death and injury, and livelihood challenges related to the loss of livestock, or access restrictions to contaminated farmlands and forests. Women who had been left widowed, after their husbands stepped on landmines, reported serious grievances to KHRG as they struggled to provide for their families. 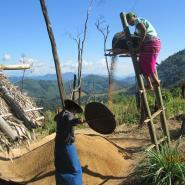 Women reported fewer instances of being targets for forced labour after the 2012 preliminary ceasefire, although on some occasions groups of women were forced to undertake labour on behalf of the Tatmadaw or BGFs operating across southeast Myanmar, usually to cut bamboo, assist with construction work, or provide thatched shingles. KHRG received no reports of villagers being properly compensated retroactively for forced labour they had been made to undertake. In some cases of agency, villagers were able to directly negotiate with the perpetrators to limit forced labour requests; however, some were punished for refusing to comply with orders for forced labour. Reports received by KHRG concerning violent abuse, killing, and explicit threats indicated that most victims of these abuses were men. Cases where women were violently abused or killed most often involved accusations of witchcraft within a woman’s family, or women speaking out against drug trafficking and use. Women who had already suffered some form of abuse reported facing explicit threats or violence by perpetrators when seeking justice. In many cases where women were offered some form of compensation, they expressed reluctance to accept it on terms dictated by the perpetrators. Women reported being targeted for extortion and arbitrary taxation throughout KHRG’s research areas. These abuses were generally committed by armed actors or the Myanmar police. Arbitrary taxation demands affected women through taxation on livelihood activities, such as farming, logging, and travelling; extortion cases were less frequent and involved criminal proceedings where women were asked to pay bribes. In cases of women’s agency, women directly refused to pay taxes, or negotiated with those demanding the tax to lower the amount, or requested official receipts, as a means of defiance. These recommendations are derived from KHRG field research, informal interviews with key informants, and input from both KHRG field and advocacy staff. Improve justice mechanisms and enact the Protection and Prevention of Violence Against Women Bill, so that women can safely report cases of gender-based violence and other abuse, such as land confiscations, to local authorities who can bring the perpetrators before independent and impartial civilian courts, in accordance with Articles 1 and 2 of CEDAW and CEDAW General Recommendations 19 and 33. Ensure that local officials, village heads, law enforcement authorities and military actors are trained in gender sensitivity to appropriately respond to cases of gender-based violence and that their awareness is raised to change practices and social norms that are harmful for women, in accordance with Articles 1, 2, and 5 of CEDAW and CEDAW General Recommendation 19. Provide training to and build the awareness of local administration offices (township and ward/village tract levels) on issues of gender inequality and (rural) women’s rights, including on the right of women (and men) to (jointly) register their land, in accordance with Articles 1, 2, 5, and 14-16 of CEDAW and CEDAW General Recommendations 3, 21, 27 and 34. Work towards equal representation of women in leadership positions, including women from different ethnic backgrounds and women that have returned after being displaced, at local, regional and national levels of governance, as well as representative functions at the international level, and consider the use of temporary special measures to achieve this goal, in accordance with Articles 1-4, 7 and 8 of CEDAW and CEDAW General Recommendations 5, 23 and 25. Address livelihood concerns affecting rural women due to land confiscations, landmines, and other human rights abuses, by supporting them with education, counselling, healthcare and social security programmes, in accordance with Article 14 of CEDAW and CEDAW General Recommendation 34. The Government of Myanmar should ratify the Optional Protocol to CEDAW (OP-CEDAW) so that women can submit individual complaints to the CEDAW Committee. 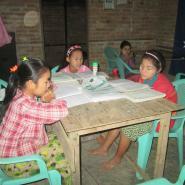 The Myanmar Ministry of Education and the Karen Education Department should invest in making more middle and high schools available in rural areas, after consulting with local communities, to ensure that young women can access education without concern for their personal safety, in accordance with Articles 10 and 14 of CEDAW and General Recommendation 34. The Myanmar Ministry of Education and the Karen Education Department should ensure schools include awareness-raising on sexual violence and gender sensitivity in their curricula in accordance with Article 10 of CEDAW and CEDAW General Recommendations 3 and 19. The Myanmar Ministry of Health and the Karen Department of Health and Welfare should ensure that healthcare, in particular maternal healthcare, is made available and affordable to all women in rural areas without discrimination, in accordance with Articles 12 and 14 of CEDAW and CEDAW General Recommendations 24 and 34. The Myanmar Ministry of Health and the Karen Department of Health and Welfare should make sure that health interventions are implemented through discussion and collaboration with rural women, ensuring their informed consent, and health interventions should be coordinated with locally trusted healthcare providers before implementation in rural areas, in accordance with Articles 12 and 14 of CEDAW and General Recommendations 24 and 34. Support efforts towards the de-escalation of conflict, especially near civilian areas, to reduce the risk of (gender-based) violence against women and to protect women from conflict, in line with Article 1 of CEDAW, CEDAW General Recommendation 30, the Declaration of Commitment to End Sexual Violence in Conflict (2013) and UN Security Council resolutions on sexual violence 1325 (2000), 1820 (2008), 1888 (2009), 1960 (2010) and 2106 (2013). Hold military personnel accountable for (gender-based) violence against women in fair and transparent judicial processes, whilst paying due regard to gender sensitivities of the female victims, in accordance with Articles 1 and 2 of CEDAW and CEDAW General Recommendations 19 and 33. Support in the training of and provide guidance to government and independent midwives and rural health workers to improve healthcare, in particular maternal healthcare, for women in rural areas. Support and encourage women’s participation and representation in meaningful consultations, dialogues and community decision-making, for example by empowering women through trainings and providing educational resources. Prioritise funding for local community-based organisations, both in southeast Myanmar and along the border area in Thailand, which provide training and support in essential services, including healthcare and education, and support services for victims of gender-based violence. Support and fund programmes that require the equal participation and involvement of women from different ethnic backgrounds at all levels of governance, decision-making and dialogue. Provide additional funding, training and capacity-building for civil society organisations working in southeast Myanmar to improve healthcare, in particular maternal healthcare, for women in rural areas.